25 lbs of Worm Castings! 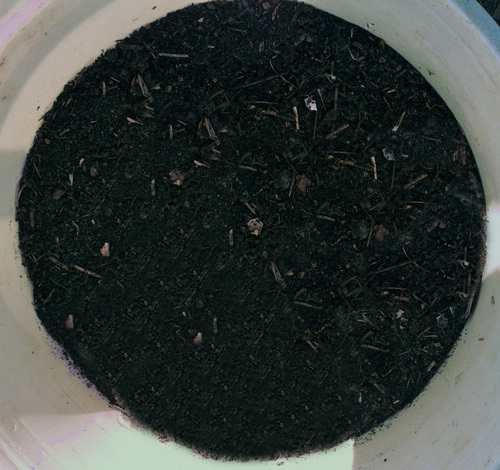 Worm castings or vermicompost as it is called is an excellent, nutrient-rich organic fertilizer and soil conditioner you can get at the garden nurseries. Last year while planting tomatoes I added some worm castings that I bought to put in each hole with the plants to make the soil richer. I vowed that I would not buy them again as they are expensive. I thought with all stuff here on the property that I could feed the worms, I should get some red wiggler worms and become a worm farmer. So I did. Wednesday I ‘harvested’ my first worm castings. My worm bin is outside and consists of some straw bales formed in a ‘U’ shape that I have across from the chicken coop. I built it last fall and have fed the red wigglers a variety of food including giant pumpkins, coffee grounds, eggshells, straw, newspaper, fruit (no citrus-it will kill them) and vegetable kitchen scraps. 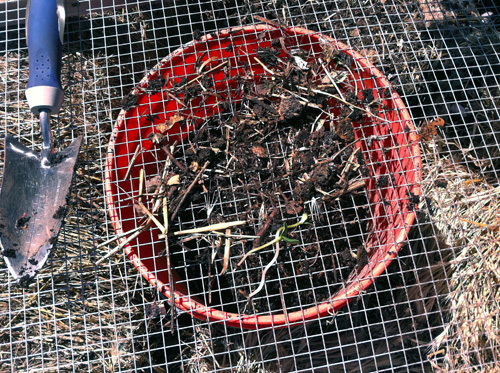 Just like a regular compost bin but no work is involved-no turning the pile over and over to get it to decompose. The worms do the work. They eat everything and leave their castings behind. I built a screen to sift out the worms and debris from the castings. I sifted it twice to make sure I got the worms and stuff separated from the castings. I got a full 5 gallon bucket of castings! Unbelievable and wonderful! I took it up to the house to see how much the bucket weighed and it weighed 25 lbs!